This Update looks at the debate over plans by the new Trump Administration in Washington to move the US Embassy from Tel Aviv to Jerusalem – though it now says nothing has yet been finally decided on this – and especially examines claims that such a move will be inimical to hopes for Israeli-Palestinian peace. First up is Israel strategic expert Col. (res.) Eran Lerman, who makes the case that contrary to these claims, such a move may actually improve prospects for peace in the long-run. He says the Palestinians are seeking an impossibility in Jerusalem – a return to the pre-1967 division of the city with all 200,000 Jewish residents living over the previous border expelled – and a move of the Embassy to the undisputedly Israeli western part of Jerusalem should help undo their unrealistic expectations. At the same time, it will also signal that outlandish threats of violence – such as are currently being issued – will not work, but that measures to reward and bolster Arab and Palestinian pragmatists can help build on any Embassy move. For his full analysis, CLICK HERE. Another argument that the Embassy move would be a useful correction to past peace process mistakes come from American thinktank scholar Abraham R. Wagner. 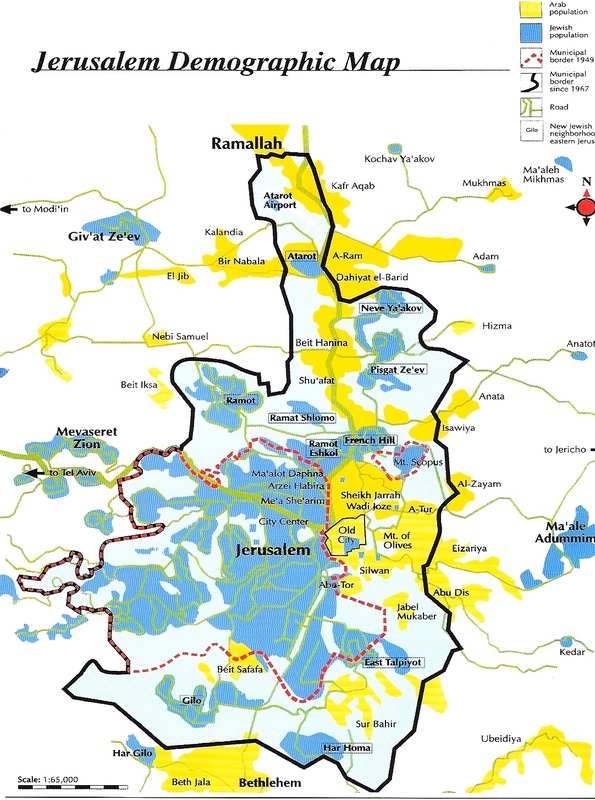 More on the important role of Jerusalem in the Israeli-Palestinian dispute from Israeli strategic thinker Prof. Efraim Inbar. A new study by former Israeli editor turned academic Hirsh Goodman on past unilateral Israel withdrawals and the lessons to be learned from them – with implications both for the West Bank and Jerusalem in any future peace process. Some thoughts on the new Trump Administration and its implications for Israel and the Palestinians, from Dore Gold, former Israeli diplomat and prominent academic. Plus some interesting thoughts on the wider worldview behind the Trump Administration’s foreign policy from noted American pundit Walter Russell Mead. The outgoing Obama Administration sent previously blocked aid to the Palestinians as one of its final acts. Veteran Israeli columnist Evelyn Gordon on what US aid to Israel buys for Washington. Israeli columnist Ben Dror Yemini offers some myths and facts about the background to a clash in a Bedouin village in southern Israel over housing demolitions last week, which left one Israeli police officer dead, as well as the attacker who struck police with his car. The situation in Gaza, through the eyes of Col. David Hacham, the Israeli officer who was in charge of the Strip when Hamas came to prominence there. EXECUTIVE SUMMARY: In contrast to the recent “Stop Trump” conference in Paris, a decision by the next US administration to move the US embassy to Jerusalem might be conducive to the cause of peace. It will remove the air of delusional unreality surrounding all aspects of the Jerusalem question, and modify what the Palestinians should legitimately expect to achieve at the negotiating table. It will send a message of credibility and of stern refusal to bow to threats of violence. It would still need to be packaged carefully, above all in terms of policies the key Arab players now hope to see instituted; such as the restoration of US support for traditional allies and the willingness to back them against the Iranian and Islamist threats. The Knesset, Israel’s parliament, which has been in Jerusalem’s Givat Ram neighbourhood since well before the 1967 war. Jerusalem is the capital of Israel, and no amount of UN new-speak can change that. For this reason alone, a decision to move the US Embassy to Jerusalem – as was clearly mandated by Congressional legislation – is long overdue. But it might also turn out to contribute, in the long run, to the prospects of peace. This claim stands in stark contrast to the dire warnings coming out of the Paris summit (which looks, in hindsight, like a “Stop Trump” gathering; hence the chilly British reaction). John Kerry, for example, spoke carelessly about an “explosion,” upon which radical Islamists might feel obliged to deliver. As has been so often the case in the past, however, it is the very attempt to placate Palestinian and Arab demands that makes peace less likely. A hard dose of realism may well set the stage for serious negotiations. In his rambling speech after the UNSCR 2334 vote, Kerry suggested that Jerusalem can be kept united while serving as the capital of two sovereign states (a somewhat paradoxical proposition). Soft and fuzzy phrases about the future of Jerusalem avoid a simple truth: no Israeli government in the foreseeable future will take the knife to a living city, relinquishing the rights of the Jewish people in the very place that has been the focus of their aspirations for millennia. Some changes in the line of sovereign control are possible in outlying areas, but that is not what the Palestinians have in mind. What they want is a dramatic outcome that will confirm, retroactively, that the Jews never had a birthright in their own homeland and holy city. This would, they believe, break the moral back of the Zionist endeavor as a whole. This is precisely why it will not happen. The language of UNSCR 2334, and the atmospherics (if not the relatively harmless results) of the Paris Conference, encourage such unrealistic expectations among the Palestinians. The sooner they are disabused of these notions the better. A proposition that hinges on the dismemberment of Jerusalem or the forcible removal of hundreds of thousands of Jews from their homes is a nonstarter. The Palestinians will need to grasp this premise if the two sides are ever to settle down to the business of negotiating a workable and implementable agreement. The embassy issue is an opportunity to get back to basics. The promulgators of 2334, Kerry in his speech, and the European foreign ministers (with the exception of Boris Johnson) who participated in the Paris conference proceeded from the assumption that their object was to save the two-state solution. They were, in fact, doing the opposite. 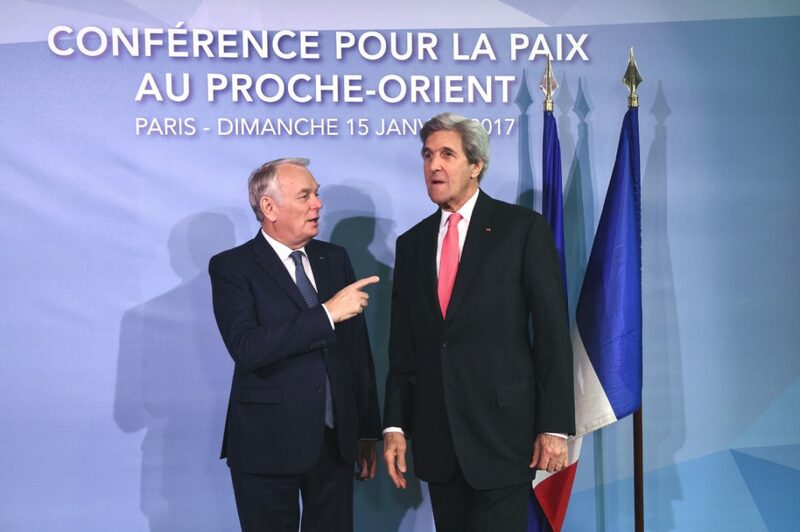 US Secretary of State John Kerry, with his French counter-part Jean-Marc Ayrault at the Paris peace conference – which claimed to be saving the two-state solution but was acftually doing the opposite. As a majority of Israelis have said again and again, in surveys and through the electoral process: a Palestinian state may be possible, but not on Palestinian terms. When much of the world, including the outgoing US administration, buys into the Amr Musa and Saeb Erekat school of negotiations – which posits that Israel, the aggressor, has no right to an inch beyond the 1949 armistice lines, and a total withdrawal, removal of all Israelis living there, partition of Jerusalem, and the right of return are the “objective requirements of peace” – a dose of cold water is in order. None of that is what UNSCR 242 requires. Nor is it what any true reading of the events of 1948 and 1967 would warrant. A symbolic act such as the establishment of a US Embassy, or at least the installation of some of its functions, in (West!) Jerusalem should help to undo this unrealistic set of demands and expectations. It would also send a clear signal to the Palestinians, including key members of Mahmoud Abbas’s own Fatah, that their outlandish threats of violence – “we shall open the gates of hell” upon America – will not work, and will no longer be tolerated from an entity that enjoys generous US aid. To validate such threats, as Kerry did, is to succumb to the same mistake that President Clinton made in 2000, when he responded frantically to the Palestinian burst of violence. In effect, Clinton signaled to Arafat that his strategy of violence had worked, and he could now extract better terms than what he had been offered at Camp David a few months earlier. The results were sad but predictable, as they would be if Washington again bows to such coercion. Having said all this, it would be wise for the incoming administration to build a framework or package of measures that would help Palestinian and Arab pragmatists (there is nothing to hope for from the radicals) explain why it would be better to swallow this bitter pill. After all, this is about moving the US embassy to West Jerusalem, which even the Palestinians acknowledge is part of Israel. The US could increase their material rewards, as Israel just did on the water issue. It could sustain the right of waiver over the suspension of aid, which seems likely to flow from new legislation on PA funding for terrorists and their families. It could – indeed must – give Egypt and Jordan a much firmer level of support than what they came to expect from Obama. Above all, by forging a new and robust interaction with the key Gulf states based on a much more aggressive stance towards the Iranian regime, the incoming administration would greatly reduce the likelihood of an “explosion” in the Arab world. If done right, and in the right context, moving the US embassy to Jerusalem might bring home to the PA the sheer futility of their strategy of threats and of international gatherings and impositions. Col. (res.) Dr. Eran Lerman, a senior research associate at the BESA Center, is former deputy for foreign policy and international affairs at the Israel National Security Council. He is also a member of the faculty at Shalem College. Why should we allow right wingers to claim only they care about Jerusalem’s place in Jewish history and identity? Israeli leftists should back President-elect Trump’s pledge to relocate the American embassy from Tel Aviv to Jerusalem. Why? For two key reasons: first, because it is justified, and not just in terms of finally implementing the 1995 congressional decision to do so, but, secondly, because it is a tactical error to create even the appearance that the Israeli left cares less about Jerusalem than other Jews do. At a time when our extreme right-wing government is anticipating that the Trump administration will green light its expansionist plans in the West Bank, we cannot afford to be perceived as being more understanding of the feelings of our Palestinian neighbors, or more sympathetic to the views of our enemies, than to our own deep emotional, cultural and historical attachments to Jerusalem. The debate over Jerusalem has to evolve to reflect today’s reality. No one in Israel imagines Jerusalem will not continue to be the capital of our country or the seat of our government, or that Israel would ever turn over control of Jerusalem to an international agency. Supporting the relocation of the American embassy would enhance the left’s legitimacy in Israeli eyes to fight the far more reprehensible aspirations that Israel’s government and Ambassador-designate David Friedman appear to share; annexing some of the Occupied Territories, sustaining the Occupation indefinitely, or advancing the nightmare scenario U.S. Secretary State John Kerry outlined last week: a binational state of almost equal numbers of Jews and Palestinians, the latter doomed to settle permanently for unequal rights. But supporting the move is not just a question of building tactical leverage; there is justice to the move, too. It is one of the quirks of the ongoing appeasement of Arab countries and the Islamic world that the United States and all other nations have kept their embassies in Tel Aviv. Long after the Arab oil boycott was relocated to the dustbin of history, this historical oddity remains because of the anticipated apocalyptic response; the peace process would be derailed, permanently, or the Islamic world would rise up in revolt. But today, there is no peace process and the Arab world is divided and preoccupied with ISIS, Syria, Iraq and Yemen. Iran, ISIS, Hamas and Hezbollah would doubtless use the embassy move for propaganda purposes, but they are hardly in short supply of anti-American or anti-Israeli rhetoric. Jordan and the so-called “moderate Sunni states,” Saudi Arabia and Egypt, would require careful diplomacy, but the Palestinians won’t forsake their national aspirations because of the location of the American embassy. I am not saying the local and international fears of a violent response to an embassy move are unjustified – but that those violent reactions would themselves be unjustified and should not be legitimated. We have seen Jews and Palestinians pay in blood for the hot button hysteria around “threats to Jerusalem/Al-Quds” deployed periodically to whip up anger against Israel. But why should the Israeli left be more concerned about security or about provoking a negative Palestinian reaction than the Israeli right, or the American government? Because feelings about Jerusalem are so intense, it is crucially important how the move is made, and what it is meant to convey. It would have been better if the embassy had been relocated by an American administration more judicious than the Trump team seems likely to be. They might have ameliorated Arab opposition while harvesting Israeli public good will. But if the next American administration believes it can manage the security concerns potentially triggered by relocating its embassy, and even if it really just wants a showy demonstration of how it is different than previous administrations, we on Israel’s left should celebrate this recognition of our capital, rather than obstruct it. Israel, of course, would still be responsible for our security concerns, and our leaders would have to determine if the risk is worth the gain, including the potential impact on regional ties with Arab countries. The status of Jerusalem and the occupation of the rest of the West Bank occupy separate compartments in Israeli Jewish consciousness, but as UN Security Council Resolution 2334 showed, this is not the case in the international community. The endorsement signaled by an American embassy move might help separate these two issues and shake something loose for Israelis and Palestinians, and give us the confidence to address the status of Jerusalem’s Palestinian residents, and to share this divided city. And if, as seems likely, U.S. ambassador-designate David Friedman endorses Israeli nationalist claims for exclusive Jewish control of an undivided Jerusalem as Israel’s eternal capital, that won’t change the reality that Jerusalem is divided, that there is a Jewish Jerusalem and an Arab Jerusalem. An embassy move does not preclude – or guarantee – Palestinian aspirations for Jerusalem to serve as their own capital when their theoretical state becomes a functioning state, but that determination will be made through negotiations. And as for whether Jerusalem will be our “eternal capital” – well, we won’t be around long enough to judge. I have fears of course about the Trump administration and the potential loss of life if reactions turn violent. But the over-cautiousness of the Obama Administration – it’s not-so-tough love of Israel, the Kerry-led peace process, and its unwillingness to take on Netanyahu until its dying days – only entrenched the Occupation and encouraged delusional thinking on both sides. The settler camp has chosen to divide the Jewish People rather than abandon their territorial fantasies. We, the Jewish left, which has always seen the State of Israel and the unity of the Jewish People as more important than Judea and Samaria, must boldly assert our own patriotic commitment to the uniqueness of Jerusalem in our people’s history and to our country. In the Trump-Netanyahu era, we will have to choose our battles carefully. We should embrace the call for the American government and other countries to place their embassies in our capital, Jerusalem, while fighting a pitched battle to end the occupation. Don Futterman is the Program Director for Israel for the Moriah Fund, a private American Foundation, which works to strengthen democracy and civil society in Israel. EXECUTIVE SUMMARY: The “art of the deal” does not translate directly from the world of business to the world of diplomacy. Diplomatic deal-making requires mastery of four basic elements: integration of diplomacy with the credible threat of force; the rewarding of friends and the punishing of enemies (rather than the opposite); a diplomatic focus on interests rather than emotions; and a refusal to condescend to the citizens who will be affected. 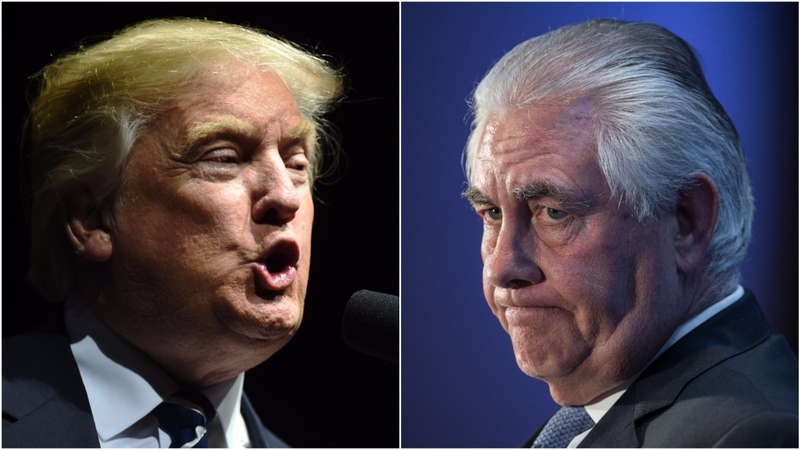 New US President Donald Trump and his Secretary of State designate Rex Tillerson need to learn from the mistakes of their predecessors and observe the four basic elements of diplomacy. However, throughout the Obama presidency, the essential role of power in international diplomacy was largely ignored. Obama’s first major foreign policy initiative took place in Cairo in March 2009, when he called for freedom, democracy, and friendship between the US and the Arab world. But there was no action plan behind the speech – no carrots and no sticks. In all of Obama’s Middle East activities, including supporting the ouster of Mubarak in 2011, which was followed by the ascent of the Muslim Brotherhood and then the return of a military regime, interests and power were largely ignored. In the few instances in which Obama threatened to use force, there was no follow-through. (The killing of Bin Laden was a one-time attack against an individual, not an ongoing strategy against a state or terror group.) In Syria, Obama warned the Assad regime that there would be zero tolerance for the use of chemical weapons, but he failed to follow through. When Assad crossed that red line, Obama canceled the planned military strike, instead adopting a Russian-led plan to remove Syria’s chemical arms. Some of these weapons were reportedly shipped out of Syria, but there was no verification of this, and enough remained to allow Assad to employ them again. What might have been a diplomatic success was erased as soon as the use of force was off the table, and with this failure, any option for American diplomacy in Syria disappeared. For John Kerry and Barack Obama, their main diplomatic “success” was the agreement with the Iranian regime on their illicit nuclear program. Along the way, Washington eschewed every form of leverage (see point 1). To avoid friction and maintain good feelings, the US allowed Iran to continue many of its ongoing weapons-related activities, including upgrading centrifuges, testing new and better ballistic missiles, and, more importantly, supporting terror, including Hezbollah’s butchery on behalf of the Assad regime in Syria. When Iran captured, detained, and humiliated American sailors, Obama and Kerry continued to smile, obtaining their release by sending planeloads of dollars to Iran. This was a classic example of rewarding enemies, while friends, such as Israel, which opposed the deal (a vast understatement), were treated like enemies. Obama and Kerry also tried to befriend triumphalist Russia. In 2012, as Putin began to flex his muscles, Obama told Russia’s puppet president, Dmitry Medvedev, that “After my election I will have more flexibility” in meeting Russian demands regarding American missile defense deployment and other issues. Shortly afterwards, when Putin started re-establishing the Russian empire by taking parts of Ukraine, Kerry and Obama took no action. This scenario was repeated as Russia joined Iran in Syria to destroy not only IS, but every other alternative to the brutal Assad regime as well. A constant flow of summits and phony ceasefire agreements notwithstanding, America was, at best, a passive bystander to the slaughter in Aleppo and elsewhere. At the same time, throughout his presidency, Obama, the non-diplomat, heaped scorn and isolation on Egypt and Israel – the two reliable American allies in the highly unstable Middle East. For enacting policies designed to protect Israel’s citizens from terror, Netanyahu was treated like a political leper by US administration officials. Other allies, including those in the Asia-Pacific region, began to distance themselves from Washington as they realized that being close was more dangerous. Successful diplomats leave their personal likes and dislikes outside the negotiating room. While friendship and personal links can sometimes smooth the path towards agreement and loathing can block an otherwise sensible deal, these are supposed to be aberrations. Although a carefully managed display of emotions can have a tactical impact, effective diplomats are like top poker players, careful not to reveal their hand, their mood, or their next move. Kissinger was a master at this, to the point that he was often accused of being stone-hearted and impervious to emotion. But by sticking to a grand strategy and keeping his eye on long-term goals, Kissinger negotiated agreements with Russia and China and eventually to end the war in Vietnam. In the Middle East, after the 1973 war, he maneuvered Egypt and Israel into disengagement agreements, setting up the subsequent peace treaty. In all of these instances, Kissinger stuck to interest-based negotiations. Similarly, the 1979 peace treaty negotiated by Begin and Sadat – the greatest diplomatic accomplishment of recent decades – highlights the irrelevance of emotions or personal likes and dislikes. We do not know how the leaders of Israel and Egypt felt about each other. The evidence indicates that there were periods of cooperation as well as intense frustration. But the bottom line for both was the centrality of interests and substance. After 18 months of often difficult negotiations, they emerged with a treaty that has held up for 38 years and is still going strong. For John Kerry, in contrast, personal friendships are the essence of diplomacy. In photo-ops during negotiations with President Rouhani and Foreign Minister Zarif over Tehran’s illicit nuclear program, Kerry exuded warmth, regardless of the situation. To avoid upsetting his partners, he ensured that the Iranian regime received almost everything it sought. Even when Iran captured and took American sailors hostage, in blatant violation of international norms, Kerry and Obama could not bring themselves to break off the nuclear talks. Compare this approach to Kerry’s hour-long and strangely timed farewell speech on the Israeli-Palestinian conflict. His anger towards Prime Minister Netanyahu was palpable from the beginning, and grew as he went through the charge sheet. Kerry blamed Netanyahu for refusing to accept optimistic (or naïve) American advice, but showed no anger or disappointment towards the Palestinians. The display of emotion was entirely out of synch with the substantive messaging, which tried to tell both sides that peace was a matter of fundamental rational interests. Diplomats who arrogantly tell people they are wrong, and that they know better than the people what is good for them, get little traction. Sovereignty and independence are important to identity, and no country’s citizens relish being patronized by outsiders. A major factor in the British vote to leave the EU (Brexit) was the combination of EU official paternalism and the fear of the loss of national identity. Leaders who reject patronizing external pressures usually enhance their standing. Presidents Reagan, Clinton, and George W. Bush were skilled at avoiding the appearance of condescension when engaged in diplomacy. Obama, on the other hand, was one of the most patronizing presidents in decades. He clearly believed he knew what was best for everyone, including American allies. In the Middle East, Obama sought to go over the heads of political leaders, as in his March 2009 Cairo speech. In March 2013, Obama addressed hundreds of Israeli students in an attempt to sell policies for peace that were in pointed contrast to the policies of the coalition led by Netanyahu. Obama’s performance was, as usual, very polished, but the details and examples he employed were far from the daily experience of Israelis. He appeared patronizing, and the gambit failed. Similarly, in their last-minute initiatives focused on Israel, including the American decision to abstain (and thus passively support) UNSCR 2334 and the subsequent speech on the evil of settlements, Obama and Kerry repeatedly instructed Israelis that the policies they recommended (e.g., end settlements, two states, etc.) were for Israelis’ own good. The message was that Americans could define Israeli interests better than the country’s elected leaders. This did not help them win friends or influence people. If international negotiations on war and peace were simple and straightforward, the world would be a calmer place. But the reality is far more complex, as the Obama-Kerry track record shows. Before launching diplomatic initiatives or responding to others, Mr. Trump and Mr. Tillerson would be wise to review these principles and learn a few lessons from history. Gerald M. Steinberg is a professor of political studies at Bar-Ilan University, founder of the graduate program on Conflict Management and Negotiation, and president of NGO Monitor.